What’s the Purpose of STM? 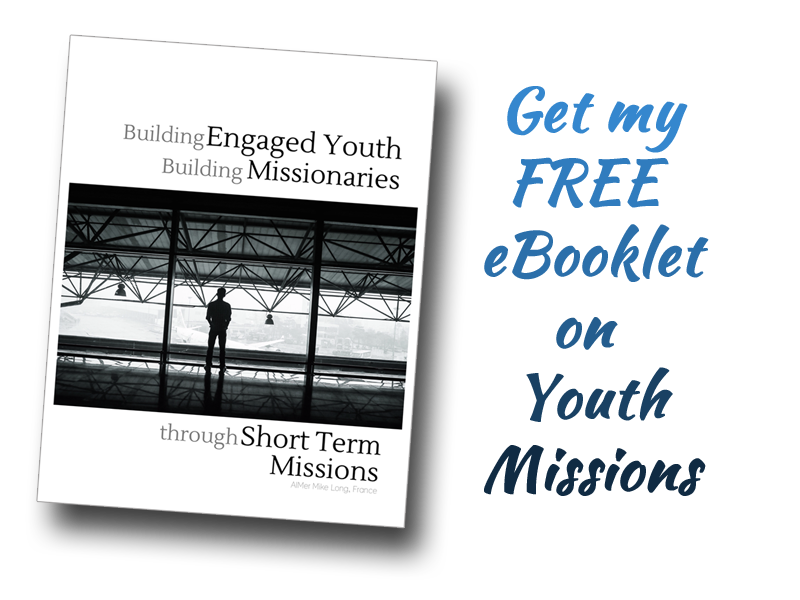 Someone recently asked me what the goal or purpose was of short-term missions in general. If you were to check the website of a dozen sending organizations, you’d likely see a variety of uniquely worded statements, but the goal of STM is essentially three-fold. Organizations will focus on one or more of these three aspects, to various extents or in various combinations. STM assists missions’ staff and overseas churches to spread the Gospel. STM provides participants with excellent training & personal growth opportunities. STM constitutes a recruitment funnel for sending organizations. You are well on your way to taking part in your upcoming Short-Term Missions trip. One of the next things you need to focus on is preparing yourself spiritually for your time away. You can begin, now, to build habits that no one will see but which could have a huge impact on you when you arrive on location. So you want to be involved in short term missions (STM)… Yours is a noble aspiration. an extra-large cup of coffee to wash it down… Enjoy! So… you have visioned, prayed, applied and been accepted to serve as an AIMer. Now what? Now you start the check list (…the dozen or so checklists, if you’re anything like me), you know the one… the “I-have-so-many-things-to-do-and-I-don’t-know-where-to-start” checklist. Over time, my own STM involvement has required that I do my share of fundraising, and I’m by no means a specialist. It takes ideas and today… idea generation often begins with a Google search. Both sites below have premium product or content for sale, but the links provided take you to free content (articles or blog-posts). As a rule… Communication is key with any relationship building exercise related to raising financial partners. Marketing: Whether you think in these terms or not… you must become a marketer. What are you marketing? You’re building a brand…. something that becomes immediately identifiable with you and your God-appointed mission. You need to be present in various Social Media platforms. Go where your potential supporters are. You don’t have to be a ninja on every platform… but you should be present in several. Communication needs to be image-rich. The days of text-only reports, newsletters or blog posts are gone. Don’t kill yourself trying to learn all of these things at once… but if you can either (a) learn them bit-by-bit or (b) get help from someone who knows this stuff… your fundraising will be further ahead. Keep a Personal Element: Mass communication is by far, much easier and it’s unthinkable to handwrite every request-for-support letter that you intend to mail out, however keeping a bit of a personal element in there somewhere will help your fundraising efforts. Stop to think… how much time do you spend reading the email that’s been cc’d to 1,000 people? Right, not that much. Now… what about the emails that have your name and your name only in the “to” box? Right again… there’s a much better chance you’ll read it through. Find some way to keep it personal. Quality Speaks: Whatever you do in terms of marketing materials, whether online or in printed form, you need to make things look good! Pastors and church-members get many appeals for financial support, so yours must stand out. In a series of upcoming posts, I’ll share how I applied the ideas above into our own fundraising efforts leading up to France and since we’ve been here. BUT… if you’ve been accepted by a sending organization and already have a time frame for your STM trip, start now! Time goes quickly and the more you do now, the less stress & scrambling you’ll experience at the last minute. STM involvement is an incredible opportunity. If God has called you and men have affirmed you (sending organization), you are well positioned to live an extraordinary life. If you have questions, leave them either in the comments section below or email me via the “E-Mail” button. The Sort of Great Escape! and All the time… God is good! This week we published our bi-monthly newsletter for August and September. It can be downloaded in .pdf format by clicking the link on this page. Wondering how to use a newsletter beyond simply reading it? Cut the top header off and stick it on your fridge as a reminder, “at a glance” to pray for France. Pray for anyone mentioned by name in the newsletter: In this case… Miranda Carter and Kevin & Crystal Wallace. Pray for those mentioned by circumstance: in this case… the youth, the friends who have been helping us clean up the hedge and Bible School students. Our financial account is listed. If you are unable to give financially yourself, pray specifically that our financial needs would be met. Share it with friends who have either an interest in missions generally or an interest in France specifically – ask them to pray. This is an IBF weekend… so as many of you are reading this, I’ll be teaching 2 Timothy to the Bible School students. My involvement in IBF, gives me a chance to get out of Châtellerault each month; to see other places and spend time with different people. Pastors can relate to this and particularly home-missions pastors… sometimes you need to connect with people outside of your local congregation. IBF gives me that opportunity regularly, but not so for Liz and the kids. Since Bible school students usually travel with me, there is not enough space in the car for the family… but this weekend is a break from that. Yesterday was “field trip day” as far as school was concerned and we left in the morning, arriving early afternoon in Paris. We roamed, lauged, “selfie-sticked” and lounged at Starbucks (a real treat as there are none in western France) and then met up with friends from the Melun church for supper and a stroll. Liz’s time is spent between overseeing 3 grade-levels of homeschool, maintaining the house, preparing a songlist for services, leading worship and getting to church an hour early each time, for music practice with the kids. Once they have gone to bed for the night… she sets about marking any assignments and preparing the next day’s overview. She NEVER stops! The kids start each day at 7:00am, start school at 8:00am and go full out all week so as to be able to go into the weekend with little to no homework. Soph is in grade 10 and Dominic in grade 8… so the workload is definitely increasing! They needed a break from the regular routine. Thank you for your support. It means a lot. I pray that God blesses you richly today! For a small town, Angles-sur-l’Anglin has a lot going on! This is where Liz & I went for our anniversary and then again for fireworks (it’s only about 25min away). Today, though, we went for their book fair. Streets throughout the entire village were filled with stands, tables & displays. Most were selling books (lots of antique books) but others were selling vintage prints, postcards or maps. I think each of us came away with a little something. My find was an old copy of the “Jerusalem Bible” in three volumes. In the picture of the kids… you may or may not be able to clearly see what they’re holding, but they each have a “travel buddy.” Travel buddies are fuzzy critters that love to travel with MKs and serve as a tangible reminder that someone, somewhere is praying specifically for them. Not only did our kids receive travel buddies from our church’s Sunday School department, before leaving, but they also received a set from Missionary to Ghana, Colleen Carter. Thank you for your regular prayers for the kids! Along with Pastor & Sis. Madjling, and their eldest daughter Marina, we enjoyed an incredible meal at the Entrecôte Restaurant. Everyone eats the same salad and main course (steak & fries)… you choose only the way you’d like it cooked. Afterwards, you have a choice of dessert. The kids, meanwhile, headed off to something a little less time consuming and found a KFC where they could get something quickly and then walk downtown to get an ice cream. It was awesome for our kids to get together with a few others. It doesn’t happen all that often so it’s precious when it does. Thanks Bro. & Sis. Madjling for your friendship & hospitality! It was particularly nice for Sophie to have another girl around. We are thankful that she decided to come spend these two weeks with us and look forward to having her back on AIM status next year, if the Lord doesn’t come back first. Today we are so happy to join with our friends Sylvain & Camille as they get married. Sylvain spent a year as a student marker for me while I taught French at the University of New Brunswick. Our friendship has continued to grow since 2002 and it’s very special to spend this day with them. … Miranda as she prepares to fly home Monday morning – safety and direction. … Me as I head to Melun Sunday afternoon for a week’s worth of teaching in the Bible School. … Liz & the kids who will hold the fort here in Châtellerault. Thank you for your love & support… you are special to us! I used to think that “Big people must never be scared of ANY-thing!” … Now I know that to be hogwash, because I are one! The propensity to experience fear is not, as I have learned, restricted to a certain age… (say “10 & under”, “11-19” or “20-24”), it’s just that our reason for fear changes depending on where we’re at in life… what we’re doing: fear is not as much age-related as it is stage-related. One of the ways I’m tempted to fear, in this new stage, is in the area of “success” versus “failure”. In North America, busyness is equated to success. If we are busy, we must be accomplishing something and conversely if we want to accomplish something… we must stay busy. So at those times where I find myself not particularly busy… I can fear that I will not accomplish; not meet the expectations of fellow missionaries or you… our supporters. Ours is a small, home-missions type church where we’re more likely to be 12-15 than we are 25-30, especially during the summer holidays (when two families are missing… we lose 10 people). Since our desire is to not just maintain, but to see growth, if that growth doesn’t happen in the short term… are we succeeding? Can mere maintenance be considered success or does it represent failure? 1 Corinthians 4.2 says “Moreover it is required of stewards (those that have been entrusted with something) that they be found faithful.” Therefore… if I’m a faithful steward of the things and the people that God has entrusted to our care… that is a measure of success. Balance: I can easily forget that we’re still in the “adjustment stage”, getting familiar with people, customs, and the practical details of living in France. On top of that, June was an intensely busy time as you’ve read. The idea that only two weeks later, I should feel negative pressure for uneventful time is itself a bit insane (yet the struggle is real). Balance can often be missing in the midst of busy-driven success. To strive for and achieve balance is a measure of success. Kids: We’re working hard to ensure that our time here is a positive experience for Sophie, Dominic & Timo. Right now that means helping them finalize the last details of their school year, alleviating their frustration. The quality of our kids’ overall experience is a measure of success. Being vs. Doing: In some economies, the steady accomplishment of tasks is the measure of success: doing. In a “spiritual economy” however, there is a need to pull back and take in before it’s possible to give out. I need to “Be still and know that HE is God” before I can effectively model the peace that comes from that and lead someone else to that realization. “Being” a Christian before I consume myself with “doing” Christian things is a measure of success. Of course we strive for growth, but until that happens, these are also measures of success. Lord… let me be successful in the most balanced of ways! These thoughts, along with the knowledge that we are exactly in the center of God’s will for our family, allow us to combat fear. I’m glad that fear is subject to the peace of God. Jayc: many of you saw our Facebook post last Monday about Jayc (pronounced Jake)… our beagle puppy. Well it’s been an eventful week! By Tuesday morning, his hind quarters (including legs) had inexplicably become paralyzed. The breeder retrieved him almost immediately and took him to the vet who felt it was an extremely rare adverse reaction to standard vaccinations. With no improvement after 4 days and an increasingly traumatized little pup, the vet suggested that the most compassionate route was to put him down. So… today we are going to pick up another puppy. It was a rough start to “Dog-dom” and there may have been a few tears shed. Please pray for Pierre, one of our members. He’s had a lot of health challenges of late and is in a 3-week treatment session to try to get under some of the issues. Next Saturday I may tell you about Canoes in the Wind… stay tuned and see you then. Same time, same place.